Tunnel under roundabout open again. Quote Reply Topic: Tunnel under roundabout open again. 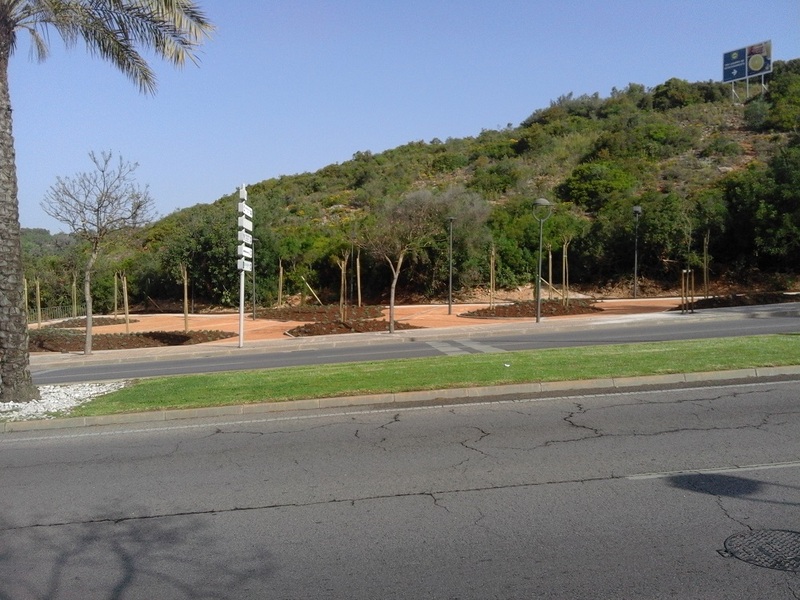 Noticed today that some landscaping and drainage work is taking place by the tunnel that goes under the roundabout at the top of Avenida Liberdade, bringing the footpath from Albufeira Camping and Clube Albufeira into town. The whole area is fenced off and the tunnel closed. You will have to walk by the road. Work still not complete! This all looks very nice, but what is it for? There are bases for something electrical to be installed. Dunno. This morning I saw some blokes busy planting shrubs etc. Still not a clue as to what purpose it may serve in life. Perhaps an area to sit if you like being 20 metres from, the roar of traffic. The tunnel is still closed. Does look nice and green though. What you cannot see is that the ditch along the left hand side of the path is completely full of mud. So as soon as it rains hard the whole area will be flooded again. Idiots. A bit further up there is quite a flow down in the river. Spoke with an operative. It is to be an ornamental garden. Lo and behold, a load of saplings arrived and have now been planted. Seems an odd place, right next to two very busy roads. The tunnel does seem to officially still be closed but people have pushed aside the barriers at both ends of the footpath. it's coming on fairly well. A nice steep set of steps has appeared. The tunnel is open again, whether officially or or otherwise I know not, but people were using it. Two workmen were welding some new fence panels. Short cut to Lidls and Aldi from the campsite and Clubbe Albufeira. The landscape architects have cleared up and cleared off, having planted some little flowers and shrubs. There are footings ready for some kind of lighting. but seats?? I will see if I can get a new picture later. All looks jolly nice. I wonder though if anyone will actuall sit there to admire the views. Tunnel and paths are fully open. Lighting has appeared. Beats me who is going to sit there in the evening under those lights. Remember this? What I though might be bases for lighting columns turn out to be bases for some rather arty seats. But who is going to sit there with the roar and fumes of the traffic just a few yards away? 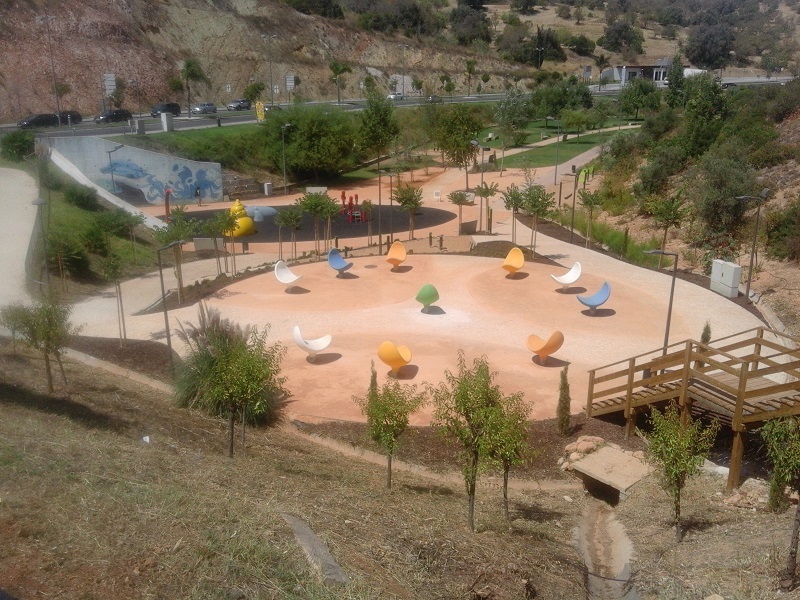 Right by the tunnel is a small area with a trampoline thing and a couple of things for small children to crawl over. Well it's obvious - installed so people can watch the very partial solar eclipse and then never used again - AKA olympic venues!! I will try one of those seats next time I walk that way. The don't look at all comfortable. Don't try it on the way home from t'pub, you might not get out of it.